The International Passive House Days was put on by the International Passive House Association (iPHA) as a part of the EuroPHit and Sinfonia projects, supported in part by Intelligent Energy Europe. From 7 – 9 November 2014, over 600 Passive House buildings in 24 countries opened their doors to introduce the public to the future of energy-efficient housing. Several thousand visitors across the globe made their way to participating buildings and got first-hand experience from both architects and Passive House residents about the tangible benefits of the highly energy-efficient Passive House Standard. As was the case last year, this year's Passive House Days was promoted through EuroPHit across the EU. Many of the case studies also took part this time around as well as other interesting retrofitting examples. Over the last 20 years, Passive House has become synonymous with quality, comfort and energy requirements low enough to be feasibly and sustainably covered with renewables. From 8 – 10 November 2013, owners and residents of Passive House buildings across the globe opened their homes and offices to share their experiences and show what Passive House is all about. 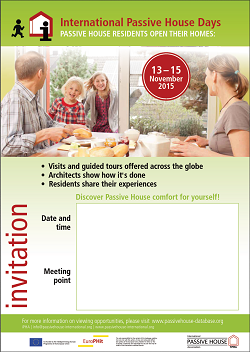 Passive House events such as open houses, guided tours, seminars and worshops, were offered in all EuroPHit regions. iPHA, the coordinator of the International Passive House Days, would like to thank all EuroPHit partners as well as all those who opened their doors for helping make the 10th International Passive House Days such a great success! Impressions and reviews of regional events around the globe are visible here. Next year's International Passive House Days will take place from 7 - 9 November 2014 - mark your calendars today! *only includes buildings registered with the Passive House Database or reported to iPHA prior to the Passive House Days. The International Passive House Days is put on by the International Passive House Association (iPHA) as a part of the EuroPHit project, supported in part by Intelligent Energy Europe.